“ Michelle’s approach is instructive without constricting each child’s artistic choices… Her support is really helping Camryn grow as an artist." My daughter has always shown an interest in and a natural talent for drawing. I found Michelle during my search for a substantive art class – one that would really help her develop and advance her (already strong) skills. Most park district classes we tried assumed that a 7 year old could barely draw circles or understand concepts of shading and symmetry – so Camryn didn’t learn much. Michelle’s approach to teaching art not only meets every 7 year old at their level, but also challenges each student to explore what more they can do during each assignment/project they work on together. We keep coming back to PraireArt because I believe that Michelle partners with me in helping Camryn along the path to identifying and mastering her own artistic style. It’s been nice to be able to talk to Michelle about how to help Camryn through those times when something she’s drawn doesn’t reflect the vision she started out with. I think Camryn values Michelle’s viewpoint because they are both artists. It’s a very relaxing atmosphere, both inside and outside of the studio! In spring and summer, we like to arrive a bit early so we can run up and down the hill outside of the studio. Once inside, I can wait on the comfy couch and sip tea or bottled water that’s provided. The studio area where the kids draw is spacious and there’s always nice, relaxing music playing. Michelle’s approach is instructive without constricting each child’s artistic choices. Instead of forcing my daughter to use the exact colors displayed in the example, she’s worked to understand my daughter’s creative vision and helped her bring it to life. Her support is really helping Camryn grow as an artist. I think Camryn is becoming less afraid of trying to draw new things. If she doesn’t like the outcome, she’s more apt to smile and try again, rather than break into tears. We are a brownie troop and our girls are very interested in painting. They really wanted to work on their painting badge so I was looking for a place who was willing to work with us on the requirements for the brownie badge and was able to create a class specific to these requirements. There are a lot of art classes out there, but we were looking for someone who was willing to customize and class and Michelle was willing to do that for us. I love that Michelle was willing to customize a class just for usand that she also incorporated 'painting techniques' into the lessons. I like that the location is not in the middle of some busy downtown shopping area. It was very quiet, we could have the windows open, and we had no problem hearing Michelle's instructions. I have done classes at another studio with my kids (a 1 hr class just to paint a specific picture), and while they do walk the kids through the drawing step by step, they didn't seem to talk to them about the different brushes, the uses for different ones, different types of strokes, etc. and I did enjoy the way Michelle taught them to mix colors, and use different strokes to get a different effect. My son has taken several art classes since he was about 3 years old. He seemed comfortable with Michelle and her method of teaching, and enjoyed focusing on drawing rather than the arts & crafts type of projects. My goal is to provide my son the opportunity to have a specific quiet time every week to focus on his creative and artistic abilities since it is something he enjoys (this may or may not happen at home or school where there are lots of distractions every day). The location is very close to our home, which works out for classes right after school or in the morning on the weekend. The studio, located in part of Michelle’s home is great (my son says he wants a house like this when he is older). The studio is small, which I think, makes the students feel comfortable. The studio has a lot of character and bright light, and Michelle plays music conducive to the children’s creativity and focus. Michelle makes sure that the children know that art should not be judged (i.e. good versus bad) and that everyone has their own style of creativity. If something appears hard or challenging in the beginning, the students can see that it often turns out great in the end. Classes at PrairieArt focus on drawing skills rather than arts and crafts. The classes are pretty structured with a goal to learn drawing concepts but then also how to put your own personalization on each drawing. For example, my son drew a horse during a recent class but instead of making his brown or black, he made it purple and called it his “magical horse”, which was cool! My son’s drawing skills have of course improved, and though he at times doubts his creativity/artistic capabilities (he is only 8! ), his interest and confidence in drawing keeps returning thanks to his successes at PrairieArt classes. He has applied these drawing skills to his own projects at home and at school. It provides a specific, quiet time every week for my son to focus only on his creative side, which is often difficult to do at for young, active boys! My son is very proud of his art work. He has 3 books of his art so far and we just framed 3 of his drawings for our wall at home. I am an acrylic painter. I was always using graphite paper to trace the image onto the canvas and decided I wanted to learn to draw the images myself. PrairieArt studio is in a scenic location and is state of the art. It’s bright, airy and has plenty of work space. [In addition to weekly classes, there are] many interesting summer classes and workshops for children of all ages and adults and all the information can be found on the website. Michelle is an excellent teacher. She is always prepared with a thematic approach to art. She selects a project or an image and has many pictures that relate to the theme with background information. She provides warm-up exercise sheets to prepare the student for the project and then diagrams how to draw the image on a board in front of the room while the students [who want can follow and] draw the image. Michelle then gives suggestions for final touch ups to make the drawing more professional. Having attended eight classes with no previous drawing experience, I have seen significant improvement since I began. 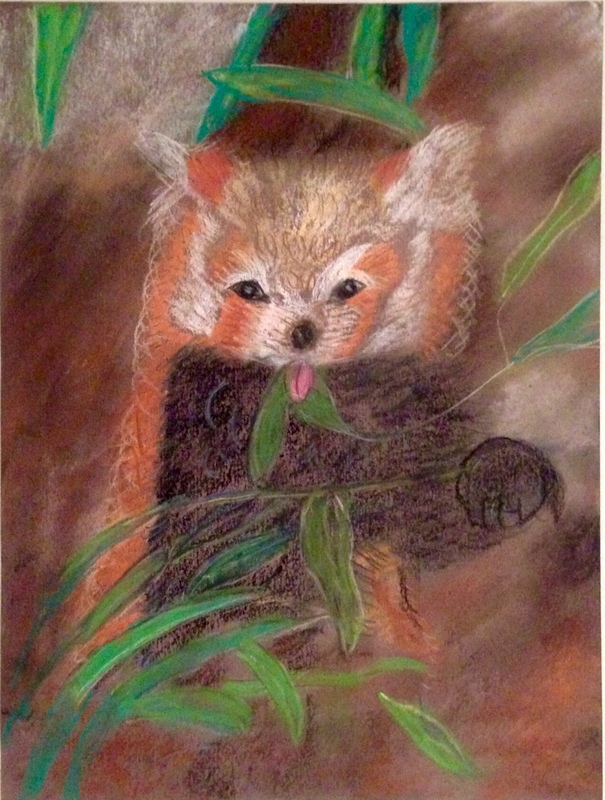 Michelle believes everyone has the ability to draw, they just need to develop the skills. PrairieArt Studio provides all the art supplies. Unlike other art classes that I have attended that give a lengthy and expensive supply list to be purchased before class. This allows you to decide your area of interest to determine where to invest in your own supplies. [Classes are catered to the student individually.] I wanted to learn about a media that Michelle was not familiar with and she was willing to invest time and money in order to instruct me. "We appreciate that before any “art” is made, each step is broken down into blocks." Aaron has always loved to draw and we wanted him to learn different techniques. We like everything about the studio facilities. It is very tranquil and seems like a great spot to do art. We especially like the fact that the studio is in a somewhat woodsy-secluded area. It makes you feel stress-free, although the kids probably cannot appreciate that. We like the background music that is played, as well. Michelle is also a great teacher. We appreciate that before any “art” is made, each step is broken down into blocks. It gives the art student a methodical way of drawing. When drawing at home, we can see that Aaron uses this approach. Although Aaron continues to draw the same thing, he has improved greatly. But when he draws something different, we can see that he’s using techniques that he’s learned. We know that Aaron doesn’t always show enthusiasm with his finished product, but that is just the way he is. We do know that he thoroughly enjoys this class. We think this gives him an opportunity for his mind to take a break and focus on one thing with no pressure and that the one thing is something that he loves. We love all the artwork Aaron has completed. We saved them all, and we've even made some of his artwork into a calendar and given them as gifts. Marker Drawing by Caitlyn, 12 years old. ..."there did not seem to be a lot of options in the area, other than very expensive ones downtown. I am thankful that we happened across your studio, and that you are so close and convenient..."
Thank you so much for an awesome camp! Caitlyn just loved it. She has been wanting to take a Manga class for quite some time, and she expresses great interest in attending an art camp this summer; however, there did not seem to be a lot of options in the area, other than very expensive ones downtown. I am thankful that we happened across your studio, and that you are so close and convenient to us, as we live in Homer Glen! Your studio has a very relaxed and artsy feel to it, and your grounds are just absolutely beautiful. I would love to take a class or workshop at your studio myself one of these days! I don't know if the other workshops this summer will fit into our schedule, as we have several trips planned, but I know Caitlyn is definitely interested in additional workshops and camps in the future. Watercolor painting by Pola, 9 yrs. old. Marker drawing by Alec, 12 yrs. old. "The major difference is in the approach..The children are not being judged, they are being encouraged to always try it and do what they think is right." My children always showed interest in art, were creative but I could not find a place or program where they would grow artistically and feel "at home" The atmosphere of the studio starts with the location. It is the feeling of being away but still in the center of the community. The outside with its lush greenery and serene vibe seems magical. The studio itself is very private with spa-like ambience. Michelle's role is more of a facilitator. The children enjoy the simple and straightforward guidance and freedom in making their own choices. As a result my children gained more self confidence in trying new things in art. They are able to look outside the box, to go beyond conventions. The major difference is in the approach: everything is accepted, there is no right or wrong way of doing things. The children are not being judged, they are being encouraged to always try it and do what they think is right. There is a parent friendly, club like waiting area, where parents can unwind while gazing out at the vast forest. The classical music that softly fills the facility helps to relax and concentrate at the same time. Did I mention that coffee and tea are available as you wish?! A selection of some of the drawings from students in our July Summer 2016 Manga Camp. "Her drawings went from great to amazing. She loves using the techniques learned during class and her artwork has really improved." A friend found your website, and we signed up, too. My daughter was ecstatic when I told her about your manga camp! I had never been able to find one before. The studio is absolutely delightful. It is a comfortable space that's very welcoming with wonderful views. She enjoyed your style of teaching. The improvement in her manga drawings are impressive, as well as the work she produced during class. She has incorporated the techniques from class and is enjoying the benefits in her artwork. She has never taken a class that was so informative. Her drawings went from great to amazing. She loves using the techniques learned during class and her artwork has really improved. "I appreciate Michelle’s patience with my daughter. She has a very calm approach." I came to Prairie Art Studio because the website stated it was for all types of students, my daughter is Autistic and I had been looking everywhere for someone patient enough to work with her one on one. The thing I like most about the environment at the studio is how calm and serene it is. I appreciate Michelle’s patience with my daughter. She has a very calm approach. This class brings her to life. As a result of the instruction she is getting from Michelle at PrairieArt, she now actually wants to interact and do something other than stare at her iPad. The classes are very personal and on the spot. They are geared toward my daughter’s interests and attention span. I love the music Michelle plays in the background for my daughter, it calms and motivates her. I am grateful I found Michelle, she is a God send for my daughter. Graphite pencil drawing by Ciara, 14 years old. "Michelle made suggestions in such a way that was kind, helpful, and encouraging." We were looking for a class that could improve and enhance our daughter's art skills. Our goals for our child were to build her self- confidence around her artistic abilities while gaining knowledge from an art expert. We really enjoy the peaceful atmosphere in the studio. We enjoy the idea that children's talents are not compared but embraced. It doesn't matter how good you are at what you do, you are accepted and encouraged just like everyone else. All materials are provided in a beautiful studio with the bonus of (if the students are OK with it) a beautiful dog... and sometimes a cat... greeting you at the door. We appreciated Michelle’s method of standing back and letting our daughter express herself without judgment or negative feedback. Michelle made suggestions in such a way that was kind, helpful, and encouraging. Our daughter is better at drawing face symmetry than she was before entering the class. She is also a lot more confident and bold with her abilities. We appreciate Michelle so very much. We thank her for opening up her home/studio to our family and for everything she did for our sweet girl. Graphite Pencil drawing by Tessa, 19 year old. "I feel a lot more confident about my drawing ability." I normally would draw people in an unrealistic way such as in the style of manga or in a cartoonist way. I wanted to further my skills in drawing so I decided I wanted know how to draw people in a more realistic way. I began with looking up photos of people posing for a start, but I could only get myself so far. I came to the conclusion that I needed help so I looked up art classes near me and found that PrairieArt Studio was in a great location, well-priced, and had a variety of classes. After just a few classes there was an improvement in how I drew. I could only take so many classes before going back to college, but I want to take more classes when winter break starts. · PrairieArt had all the tools a student needs to learn or improve their drawing abilities. The atmosphere of the studio was great. Michelle would play movie instrumental music, which helped me keep focus. The location of the studio is in a nice quiet part of Orland Park with an easy drive for me. · I liked how Michelle is hands on and left drawing styles open. The picture did not need to be exact because it was a drawing. If I remember correctly she said something along the lines of ‘it’s a drawing, if you want something super realistic then it should stay a photo.’ (not an exact quote, paraphrased). She critiqued the drawing and gave constructive criticism feedback. · I feel a lot more confident about my drawing ability. I have noticed my drawing has improved with shading and detail. · Other classes I have had in the past were very cookie cutter. PrairieArt Studio's classes are different because they teach what a student wants to know. They tailor it to that students needs as well. · I have not found an art class like this that catered so much to the student’s choices. Michelle has a very unique way of teaching classes. After searching online for art studios, Prairie Art Studio was the most open to a small custom event. I found it hard to explain to other places that what I was looking for was not only unique, but would be with just 3 little girls. Michelle’s interaction with the girls was amazing. She took the time where she needed to take the time, but didn't take over the project just to make sure we met our time frame. Its not easy to work with a range of skills and ages (4,6,8) to accomplish the same goal of a beautiful piece of artwork. The location was tucked away and intimate that really inspired my girls to explore colors and items for their custom painting. The items and decor around the studio was fun and exciting. This event was very intimate and the care and concern for perfect results was defiantly a plus. The venue is perfect for a group outing. The price was competitive and wasn't something that would deter me. I have done 10+ of this style of events across the country and this would be one of the top places I would return to do other events. My girls learned new techniques that they have used on their own personal paintings since doing the event Michelle went out of her way to make a very special event and circumstance work for a special day. Her ability to take the words of what I was thinking in my head and turn it into a finished product that brought tears to my fiance's eyes is something I will never forget.